The CHARS facility has yet to have its long-delayed official opening, though. 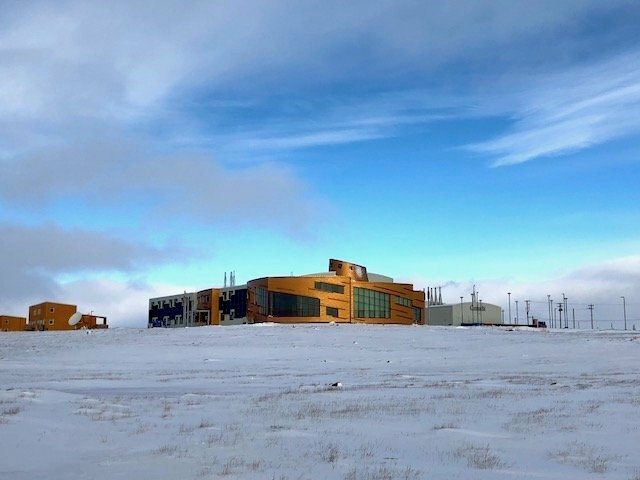 Cambridge Bay’s new Canadian High Arctic Research Station is now offering weekly public tours of its facilities. On Fridays, starting on Jan. 25, Polar Knowledge Canada, which operates the station, will offer public tours at 3 p.m.
CHARS is still waiting on an official opening, however, which was originally scheduled for July 1, 2017. First announced in 2007 by then-Prime Minister Stephen Harper, the facility has faced issues from construction safety charges to employee departures, as when its chief scientist abruptly left. CHARS has also been a source of tension with some town residents, despite its apparent economic benefits to Cambridge Bay. Polar Knowledge Canada recently decorated the halls at CHARS with wall hangings from Kitikmeot Heritage Society elders and its floors with designs like Sammy Kudluk’s dancer. The facility also brought in board members of the Kitikmeot Inuit Association for a tour in 2018, and issued a survey earlier that year asking for public input on its five-year research plan. For those interested in a tour, drop-ins for tours are welcome. Organizations need to reserve a space. Contact [email protected] to book ahead.